You spend one-third of your life in the bedroom, so if you’re susceptible to allergy attacks, a room filled with triggers might cause you to wake up feeling worse than when you went to bed. Don’t despair; you don’t have to start sleeping in a sterile laboratory or a space suit to escape allergens. Instead, you can take these simple steps towards an allergy-proof bedroom. Encasing the box springs, mattress, and pillows in mite-proof covers. Wash your bedding at least weekly in the hottest water safe for the fabric. If you are very prone to allergies, stay away from common triggers like feather-filled pillows or mattress toppers, and be cautious with wool or foam, both of which can harbor mold spores and other irritants. Instead, choose allergy-safe synthetics. You don’t have to go minimalist, but a bedroom low in clutter has fewer places for dust mites and other allergens to hide. Knickknacks and collectibles are fun, but they collect dust. Limit your bedroom accessories to just those pieces you truly love. It’s wonderful to read in bed before sleeping, but keep your library in another area of the home. Books and magazines tend to become dusty, and old paper can attract bugs. While it’s tempting to use the area under your bed for storage, this is a prime hiding zone for dust mites, along with irritating dust bunnies and general grime. Move your boxes and items needing storage to another room or the garage. Vacuuming at least once per week can significantly reduce the number of allergens in your bedroom. Use a vacuum cleaner with a HEPA filter, and make sure to get into the bedroom’s corners, under the bed and other furniture and along the surface of your dresser and windowsills. 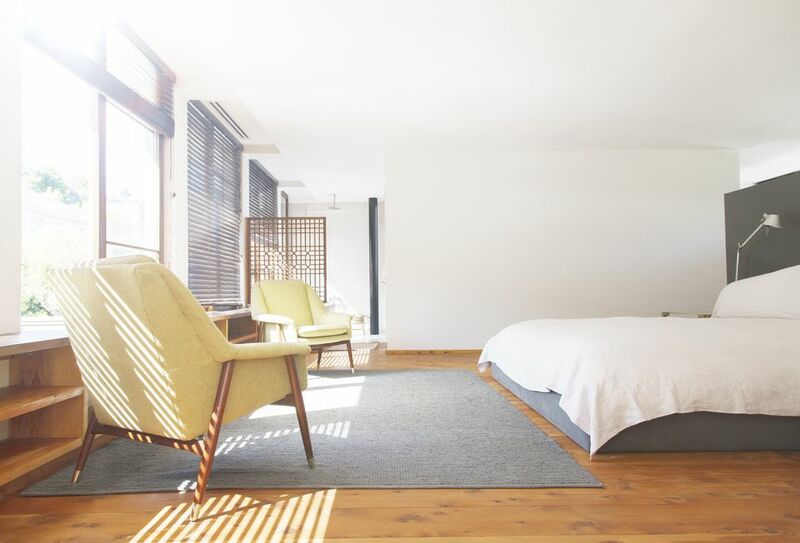 Carpet and area rugs feel wonderful underfoot and add to the style of your bedroom, but if you suffer from significant allergies or asthma, you are better off with bare wood, tile, or laminate floors. If you just can’t bear to part with your carpeting, make it a little more allergy-proof by choosing low-nap carpet, and make your bedroom a shoe-free zone. Heavy draperies collect dust and allergens. Instead, use washable, lightweight fabrics, or cover the windows with blinds or shades that can be washed or wiped down periodically. Freshen the air in your bedroom by opening the windows on clear, still days to release indoor pollutants like fumes from cleaning products or cigarette smoke. Keep the windows shut and the house fan running on windy days or times when outdoor pollen counts are high. You can also help keep pollen out of your bedroom by showering at night before slipping between the sheets and changing out of your daytime clothes before entering the room. You’re breathing the bedroom air for eight hours every day, so keep it as pure as possible. Run a room air purifier round the clock if possible, or at least during your sleeping hours. Keep windows closed when pollen levels are high. If you live in an area with high humidity, consider using a dehumidifier in your bedroom to cut down on the risk of mold. Change your furnace and AC filters regularly so they don’t blow dust back into your bedroom. Liven up your bedroom with several potted plants. Peace lily, dracaena, pothos, English ivy and Chinese evergreen are especially good at purifying the air. You can’t eliminate every source of allergy symptoms from your bedroom, but you can go a long way towards lessening their impact. If you’ve been waking up miserably looking for the nearest Kleenex, taking steps to allergy-proof your bedroom might leave you breathing a little easier.